Hello friends, I think it's safe to say I've got some major spring fever. Like winter needs to be over now!!! I want sunshine, rose all day and playing dress up in pretty spring clothes. 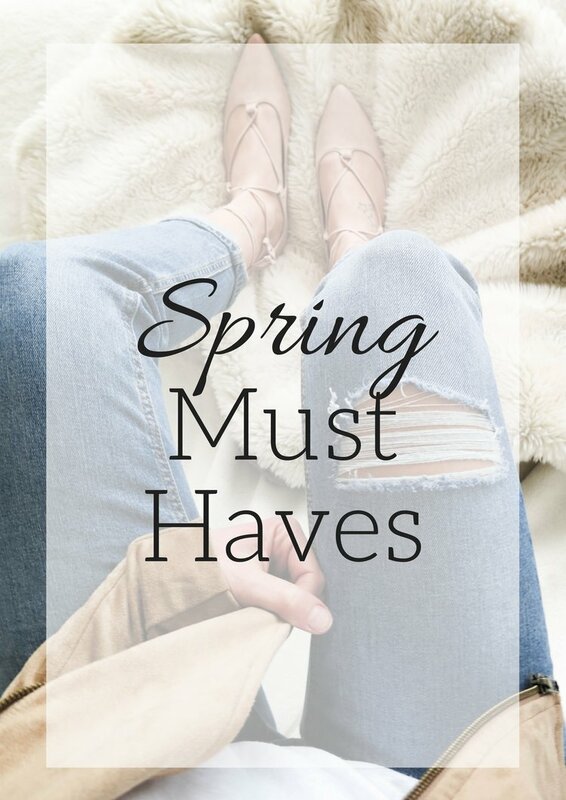 Since we are on the verge of spring, it's time to add those new pieces into your wardrobe to make sure you are ready for warmer days! I love the months where you can layer light weight pieces. Spring days are the best, chilly mornings turn into warm days. Since I am in the process of updating my wardrobe for the new season, I decided to round up my favorite things for you all to shop. The espadrille trend which was in full effect last year is even bigger this season and it's one that I love. It's the perfect spring summer shoe, because jute rope bottoms which is the defining element of the espadrille. There's so many styles you can rock in the wedge, flats and a casual sneaker inspired look. I love all of the ones I've rounded up for you but my favorite has got to be the lace up Marc Fisher platform. Jackets are the ultimate transition piece from winter to spring, as I mentioned the mornings are typically chilly making way to warmer weather. I love layer light weight pieces, I've rounded up everything from the ultimate spring jacket, the denim jacket to ever so popular moto jacket. My favorite is this BlankNYC suede moto jacket in the color coffee bean, which is totally going to make it's way into my wardrobe! Denim this season is all about the distressed boyfriend and girlfriend jean and also the mom jeans are making a major come back. you'll be sure to see more acid washed denim as well as distressed hems. To be honest I am totally loving the mom jeans, well the sexier mom fitting mom jean! The denim skirt has never really died off but it just hasn't really been in the spot like the last few years, until last spring. But this spring it is everywhere. There's so many styles of it, the distressed, the embroidered and it front slit. Through it on with a silk cami and a moto jacket and you're ready for a night out. There's so many top trends this spring, the ruffles are still a huge trend, it's bigger now than I think it ever was, there's just no getting away, but I'm not complaining. You'll also be sure to see the bell sleeve a lot more this spring and another favorite trend of mine is the front knot tee. I love this pink cold shoulder top from the Loft that I just added into my wardrobe it's a different take on the popular cold shoulder top. There's so many different shoe trends this spring, the slides, the mules and the lace up. You can be sure to see a lot of blush and grey suede. My favorite are these blush slides from Marc Fisher which I will be adding to my wardrobe as well as these blush lace up flats that I snagged from Old Navy for $24! I love a good accessory in the spring a pretty silk scarf or a pop of color from a bright clutch to make your look stand out. My favorite accessory that I just added to my wardrobe are the cateye sunglasses and they are currently $12 ! Dying over all your picks!!! I already have that neck scarf and 2 pairs of shoes in my shopping cart!! !